Today Amazon announced a new line up of Kindles. Every member of the Kindle family was updated, from the e-Ink based Kindles, to the Kindle Fire. An all new Kindle was announced as well: the Kindle Fire HD. Amazon is supporting these products with some innovative data plans and parental controls. More than any other contender in the post-PC market, Amazon is showing that there are other go-to-market strategies than copying Apple. I love it. I love my iPad, and I take it with me everywhere. With the right workflow and apps, I can do most of what I do on a MacBook but without the weight, heat and lower battery life. The iPad is a great consumption device, but I also find it to be a good email and writing (prose and code) experience too. Even basic presentation work is possible. Amazon's Kindle app offers the best reading experience on the iPad, and the retina display makes for very sharp text. What's not to love about the iPad as an e-reader? Size and weight. Longer reading sessions can become cumbersome on the iPad, and if they are late in the day you may find your battery nearly depleted. Any e-reader built on eInk doesn't share these limitations. E-Ink devices have battery lives measured in weeks, and also can be made very thin and light. For all it's advantages for reading, eInk isn't perfect. The screens are lower contrast and lower resolution that LCD displays, and they also don't glow. 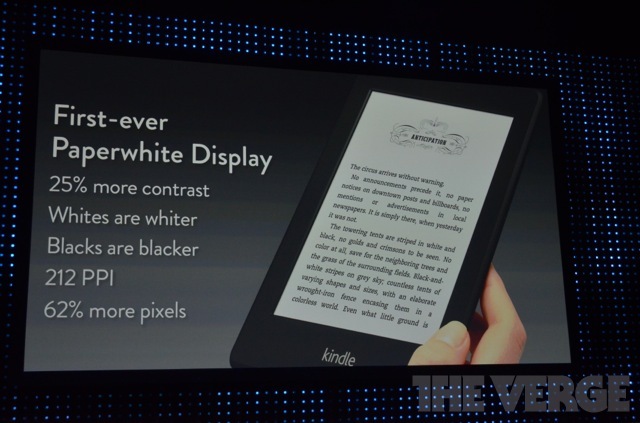 Amazon has addressed both of these issues with the new Kindle Paperwhite. It's available in for $119 as a WiFi product, or $179 with 3G networking too. Both editions include a screen light for low light situations. Amazon also slashed the price of the basic Kindle to $69. Even though I own an iPad, I'm going to get one of the paperwhite Kindles. My whole reading library is on the Amazon ecosystem already, and my reading habits stress even the long lasting batter of the iPad. These devices are a no-brainer for avid readers, and in my mind this refresh pushes Amazon back in front of Banes & Nobel's Nook. Don't call it the Kindle 2. Like Apple's iPad line, Amazon is eschewing version numbers for its Kindle products. I think that's smart–outside technology products very few consumer brands use version numbers. Can you imagine hoping over to the GM dealer to pick up a new Tacoma 17? This is a more human friendly way to market tech products. Amazon's new Kindle Fire will ship September 14 for $159. It has twice the RAM of the original Fire, a faster processor, and a longer lasting battery. 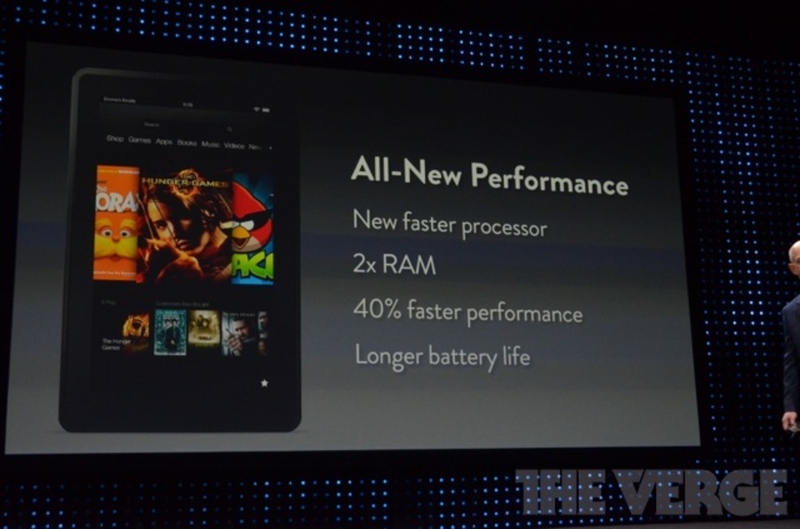 Hopefully the additional RAM will address some of the issues with responsiveness seen with the original Kindle Fire. Google has put a lot of effort into UI performance with Android 4.1, and the Nexus 7 is reported to be a very responsive device. If Amazon fails to address this issue, they're going to have a hard time gaining traction against Apple and Google. Although Apple is rumored to be near the release of a smaller iPad, today Amazon's main competition in this smaller/cheaper tablet market is Google. The Nexus 7 is an impressive device, but Amazon is really putting pressure in terms of price. Amazon has an industry leading library of content, so if the new Kindle Fire is responsive it could be a real success in the market. Amazon's entry into the full size tablet market is interesting. Instead of going with a 9.7 inch screen, the Kindle HD is 8.9. Interestingly, the display 254 DPI, rather close to the Retina iPad's 264. At $299, it's priced the same as Apple's iPad 2. Amazon is clearly encouraging customers to keep their data on its servers–the Kindle HD only has 16 GB of flash storage. That's a solid strategy when Internet connectivity is available and fast. Anyone who has tried to consumer music or movies on a plane or in the airport will tell you that assuming consistent Internet connectivity isn't always safe. The specifications on the device are impressive, and the price is great. I withhold judgement on the form factor until I can get my hands on one. I've never had a great experience with a 7" tablet so far, but I'm interested to see what 8.9" is like compared to 9.7" in terms of usability on a touch screen. More concerning is the tool set for developers when creating Kindle apps. The diversity of the Android product ecosystem means that developers can't make the same assumptions about display resolutions on these devices that they can make on iOS. The result is that Android apps are often blurry, pixelated or scaled oddly. I don't see how the Kindle Fire HD does anything but contribute to this problem. This is not a purely aesthetic issue. App usability can suffer as UI elements are dynamically resized in ways the developer could not predict. The most interesting thing to me is the pricing for the 4G LTE equipped Kindle Fire HD. : $499. This is a larger price increase that you would see on the iPad, but the data plan for the Kindle Fire HD is $49 a year. Now that's only for 250 MB per month, but the same plan on an iPad is $15 a month. If you restrict media streaming to WiFi networks, 250 MB per month is not an unreasonable amount of data for many people. As usual, Amazon is working to disrupt the revenue model of their competitors and suppliers. I'm not sure how they convinced a carrier partner to go along with this–it could affect consumer's psychological evaluation of data pricing. I hope the Kindle Fire HD succeeds. I can't see giving up my iPad, but for people who are mainly looking for web browsing and content consumption the Kindle Fire HD seems to be a credible alternative. Perhaps more than any other device, tablets get handed around the family. Children are drawn to the touch interaction model. There are many quality educational and game app available for both iOS and Android. While iOS offers good parental controls, enabling and disabling them is not easy. Apple's subtext is clear: use one device per family member. Amazon is adding user profiles and corresponding parental controls to the Fire. The idea is to make it easy to pass a device around the household, and make sure that all the apps and media are age-appropriate. Amazon also wants to make this intuitive. Based on the number of calls I get, it is neither obvious nor intuitive. to setup individual iCloud accounts with shared store accounts across iOS devices. Many families will be won over if Amazon nails this. Amazon also added a technology called X-Ray designed to help you discover new content, easily. One of my my gripes with Amazon is discovery. It's easy to order something from Amazon if you know what you want, but traditional retailers offer a much better browsing experience. The write ups on Xray don't tell me much, so I'm looking forward to seeing this in action. I wish more device makers would emulate Amazon's approach to the post PC market. Amazon is going after the value segment without trying to copy Apple's work. Microsoft is similarly original, but so far they haven't had the same success in the market place. I hope the new Kindles inspire some of the Android partners to break new ground an innovate for their customers. Nicely done, Amazon. Finally, here are some spots released by Amazon to promote their new products. Apple/Amazon got you spooked? Here's 6 ways to protect your data. While much has been written about the recent social engineering exploit affecting Apple and Amazon, and some potential solutions have been proposed, we remain in a poor information security environment today. Traditional credentials are still the primary way that people access systems. People pick a username and password combination and then reuse it as much as possible. Password security is based on entropy, and passwords with greater entropy are hard for people to remember. Even I have written about selecting and securely storing unique, high entropy passwords. Apple and Amazon's recent issue makes it clear that even people who adopt good password policies are still vulnerable to attack. So, while the nerds work on more secure, more human friendly forms of authentication, what are we do do? How can we protect our own information and privacy in an age where so much of our lives are "in the cloud?" These tips will help you secure your personal computing environment. Pick a different, strong password for every site or service you use. Ideally, use a password generator instead of your mind. 1Password and LastPass are both good solutions for automating this and make it easier to do passwords right. Dont forget your computer. Make sure you have to enter a password to use your computer. Consider using full disk encryption. Your computer is connected to the Internet and is a potential vector for attack. Give your account a nice, strong password. Be careful what software you download, and what emails you click. Malware with key loggers or phishing attacks via email are common ways that even good passwords are compromised. Use a pin code on mobile devices. Use two-factor authentication when it's offered. My Facebook, Steam, PayPal, Blizzard and other accounts all have a way to give me a time limited code to add new devices to those accounts. This adds additional security against compromise. Backup your data. More than once. I use Apple's Time Machine and CrashPlan, in addition to Dropbox. Time Machine gives me a local backup that is completely in my control. CrashPlan makes sure my data is offsite in the event of fire, theft or other disasters. Dropbox is not a backup solution, but it means I have multiple copies of my current working data. Encrypt sensitive information. I keep financial records in encrypted disk images. I keep personal information locked in 1Password. Even if Dropbox, Crashplan or an email provider i use is compromised, an attacker still won't have access to my most private information. Doing some of these things will make your computing experience less convenient, but you gain considerable resistance to attack by following these simple measures. When you have multiple backups, an attack is easier to recover from. It's a jungle out there. I don't have a Kindle yet, but I do plan to get one soon. After reading far too many blogs and magazine articles about the device, I almost got the fever. Despite the fact that there seems to be a pretty even split between those who love the device and those who loathe it, I'm still really excited about the potential of the technology. I'm an avid reader, but I don't have the time to go browse bookstores. My favorite time to read is when I travel, but books are a drag in terms of bulk and weight when I'm hoping from plane to plane. The idea of carrying--and adding to--my library on a reasonably sized device is very appealing. The Kindle as it stands is far from perfect. It's expensive, the e-ink could be better, and for goodness sakes it needs multiple fonts. I still think something like the Kindle will one day to do books and magazines what the iPod is doing to physical music media. Or at least I did until 30 minutes ago when I pulled a beautifully illustrated, large format, color children's book off the shelf to read to Madison at bedtime. We're a LONG way from matching that experience with an e-reader. Books are really not great in terms of environmental impact, they take lots of space and they're prone to wear out--but they'll be with us a long, long time.